Notify me by email when Tetris MicroCard game console becomes available. 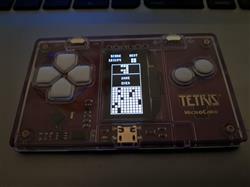 • The Arduboy team has developed customized hardware that delivers an amazing and officially licensed Tetris experience! • Brilliant OLED display in portrait layout for optimal Tetris game play. • Super durable construction featuring six control buttons and mute switch. • USB rechargeable with six hours of battery life. Playing the Tetris® MicroCard is fun and easy! Turn on the power switch and begin playing! Follow the steps below to get started! This product contains a battery. Shipping constrictions may apply. Perfect tetris device, a little pricey if you are just buying it as a trinket. But considering I'll likely be using it daily due to it's sheer convenience makes it definitely worth it for me. I was worried the buttons were going to be too small but they aren't really that small at all, and are in fact a fairly standard size. I would definitely recommend this to anyone interested in tetris! How is this a good Tetris game? This is described as wallet tetris, and it's actually perfect for that. It's got the vast majority of features you'd expect from a licensed tetris these days. Bag randomisation, shadow piece, the scoring system even recognises back to back tetris and t-spins. No hold piece, only one next piece gives the game a distinct retro feel. But a high contrast black and white screen, with nicely clicky buttons makes the whole experience a joy to play. All in all this has become one of the favourite gadgets I own, and it's a really cool gift for the tetris fanatic in your life.